The table and chair cart division of American Cart is one of the most popular. Created out of continued requests from customers for improved storage solutions, the division has plenty of growth over the last years. All the carts feature heavy duty steel construction and are powder coated for long life. The most popular table/chair storage cart is the 66″ Table Storage Cart. This cart is extremely versatile and can easily hold chairs, tables, inflatables or other oversize inventory. The other popular cart is the Chiavari Chair Cart. Capable of handling stacks of five chiavari chairs, the cart speeds up setup and tear down. The 66″ Table/Chair Storage Cart is the most popular cart from American Cart. It has become a standard for many rental companies and warehousing companies. Built from heavy duty 1.25″ square steel tubing, each cart can handle 1,500 pounds. The carts can be stacked up to three high for maximum utilization of warehouse space. The 66″ legs are removable and provide plenty of space for stacking tables. The carts can hold 30 tables with a 3-inch recess. 150 chairs can be stacked on the cart. Each table storage cart comes standard with fork lift mounts for easy transport around the warehouse. E-Track ratchet brackets are built in to every side of the cart, this allows for the load to be secured down from any angle. The Chiavari Chair Cart is one of a kind. The hand truck was developed specifically for chiavari chairs, The chairs look great but have always been a struggle to transport. The Chiavari Chair Cart solves that problem with an capacity to handle stacks of five chiavari chairs. The cart fits through a standard doorway making setup extremely easy at a variety of venues. The gray chair bracket folds up and can locked in place. This allows the cart to be used as a standard hand truck. The capacity on the cart is 500 pounds. The dual chiavari chair cart takes everything great about our standard chiavari chair and DOUBLES it! Easily pick up and move stacks of 10 chairs. The width of the cart is under 32″ allowing it to fit through most doors. 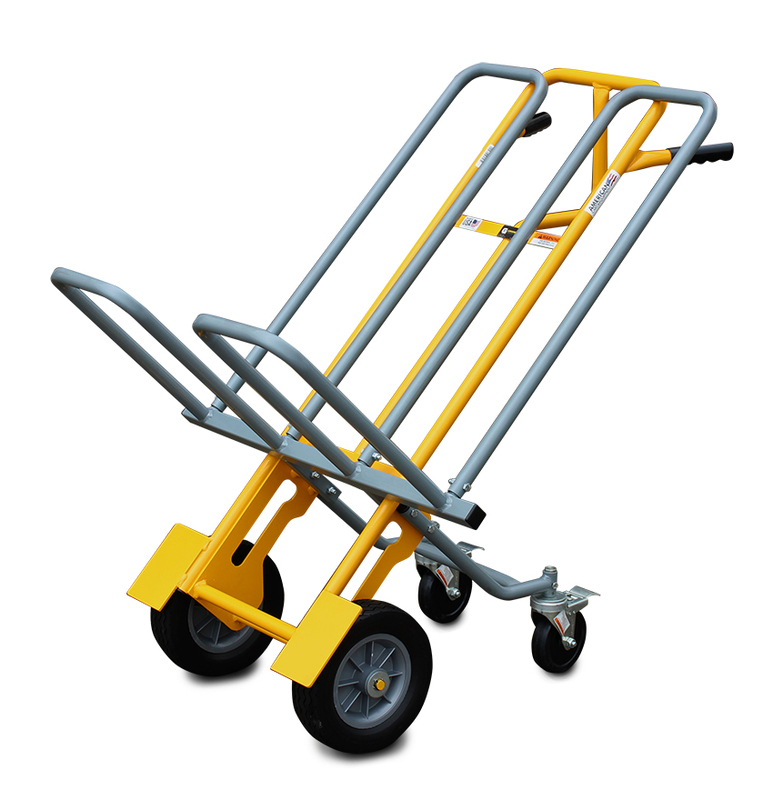 The rear wheels help to distribute the load and provide a more stable cart. Foldable Support – The gray support piece can be flipped back and stowed away with a snap pin. Allowing for use as a conventional hand truck.